What’s new with this year’s Pumpkinfest? The theme of the 28th annual festival taking place Thursday through Saturday. Pumpkinfest brochures are available at various Zeeland/Holland retail stores and the Michigan West Coast Chamber, 149 E. Main Ave. More information is at pumpkinfest-zeeland.org, or on Facebook. Among the returning family favorites are a Pumpkinfest bake off, pie-eating contest, pumpkin seed spitting event and a pumpkin rolling contest. Educational activities include blacksmith demonstrations and the Critter Barn educational zone. Seniors also are included in the offerings, including guessing games and senior bingo. Other activities include the Rotary chicken barbecue, which will take place from 2-6 p.m. on Saturday at Second Reformed Church. The entertainment tent also will be open from 8-11 p.m. Saturday and will be hosted by Vitale’s Pizza of Zeeland. The tent will be next to the restaurant and feature live music by band members of Hello Dave and Domestic Problems. The 5K and fun run for all ages is an event coordinated by the Zeeland Athletic Boosters. Proceeds will help fund activities for the youth of the community. The run is 7:45 a.m. Saturday at Zeeland Stadium. Early registrants will receive a Pumpkinfest run shirt. 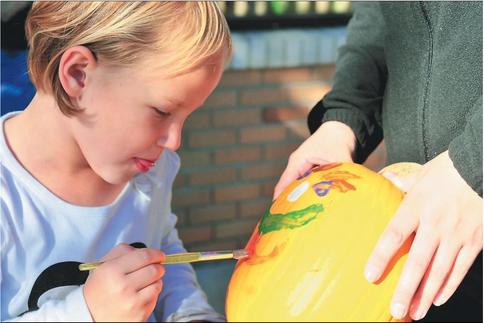 The Caring People Pumpkinfest Parade, sponsored by Spectrum Health Zeeland Community Hospital, is 3 p.m. Saturday in downtown Zeeland. The event begins with pre-parade entertainment including the local band Tarnished Brass. The parade will feature marching bands, horses, tractors and floats featuring the “Made in Zeeland” theme. This year’s parade will honor former Zeeland Mayor Les Hoogland who is the grand marshal. Alumni and guests of the restored New Groningen Schoolhouse, 10537 Paw Paw Drive, will have an opportunity to renew acquaintances and spin yarns during Pumpkinfest from 10 a.m. to 1 p.m. Saturday when the building will be open for a schoolhouse reunion. “Those who missed the previous open days are especially welcome,” said Dorothy Voss, founding member of the Zeeland Historical Society, which renovated the schoolhouse.